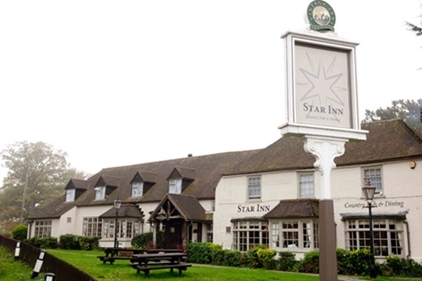 About eight miles from Newbury, take the A339(A34)S, then the A339 towards Basingstoke. The pub is on the R between Headley and Kingsclere: the car park entrance is at the Kingsclere end. It's part of the Vintage Inns chain, but has good beer and food. Leave the pub and go a few yards towards Kingsclere and take a farm track on the R. Turn L on a crossing FP for some 400 yds, turning sharp R onto Brenda Parker Way. This joins a metalled lane and then veers R with some farm buildings on the L. At a junction, keep SO bearing to the R of a field and aim to pass a black wooden hut, and follow past the disused nursery on the L, turning L at a T junction. 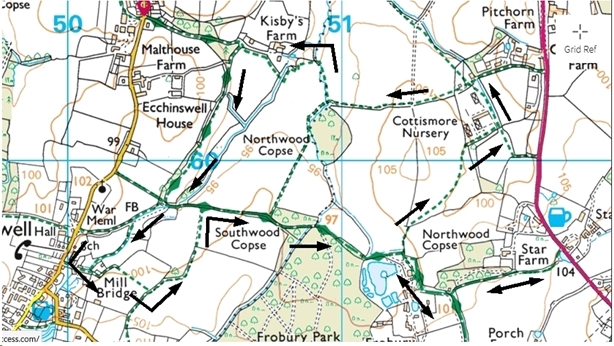 In 200yds go through the metal gates, then turn L through a wooden farm gate, following the track for 600yds before going R towards Kisby's Farm To reach this, follow the track round the edge of a field, before turning R to cross a bridge and a stile by the farmhouse. Now follow the RH edge of the field to the corner, turning L and continuing through a metal farm gate into the next field. Continue 500yds till you reach a stile on the R which cross, and leaving the brick building to your L go forward 150yds and take the FP on the L. Go forward 300yds till you pass a larchlap fence on your L and come out on a wider lane. Go L on this, round a bend to the R, and arriving in a field turn L for 400yds, crossing a plank bridge, to a T junction where turn R. Follow this wooded path for some 800yds back to the junction near farm buildings that you passed on the way out. Return to the pub by retracing your steps.